Photogrammetry tutorial 9: Quick and dirty! Over the course of previous tutorials and in my paper with Oliver Wings I’ve given quite a bit of advice on how to photogrammetrize objects properly. Today, I’ll address the other end of the spectrum: how to approach photogrammetry unprepared and without proper equipment. Oliver and I mentioned a minimum kit in our paper, but what if you’re really stuck with just a digital camera? What can you do with everyday materials to improve your results, and how do you approach the entire thing? First of all, you really need to know how to handle your camera. If you have a tripod and control over the lighting, it is easy to take in-focus and well-lit images. But if the light is low, comes from one direction, and you must hand-hold your camera, then it becomes important that you know with which lens at what zoom setting you can reliably take good photographs with what ISO settings. There’s one thing that will help you a lot that usually I’d strongly recommend against: use flash! Yes, you read that right: it is better to use a flash, even your camera’s internal flash, than take blurry photos. (If your camera doesn’t have an internal flash, then it is a top notch DSLR and I can’t believe you don’t have a whole shitload of equipment with you). There’s an important thing to do when you use your internal flash, but I’ll save that for later when I talk about the process of photographing a specimen. One thing to remember is that your zoom lenses will allow shorter exposure times / lower ISO / smaller apertures if you use them at a low extension length. So do consider stepping closer to the specimen rather than zooming in. As long as you do not go into the ultra-wide angles or use a fisheye, your models should turn out just fine. And if your modelling software happens to be Agisoft Photoscan Pro, you can even use a fisheye lens, as the program has a feature that allows dealing with fisheye distortion. Another issue with q&d photogrammetry is usually the inability to use a turntable or optimize the background. Normally, you’ll want to use a background that doesn’t offer any features for the software to detect. However, given the lower quality of images you are wont to achieve, using a feature-rich background can actually be a boon! Normally, you’ll always want to aim for one-chunk model creation, where you toss all images into one chunk, even if the specimen was moved versus the background in between. Instead, now try to use a highly structured background, such as a colour ad newspaper page! And once you’ve finished shooting the specimen from one side and move it by flipping it over, use a different feature-rich background! This way, the background can be included in model creation and thus help with alignment, but doesn’t cause images to align based on the background that were taken with different specimen positions. Put specimen on a double-wide newspaper page with colour adverts, or some other crazy stuff. Persian rug or whatever. Clean, as far as possible, the area around or use additional newspaper etc. to hide anything that would be in the picture. Shoot images from all around. Remove specimen and all stuff you used to cover the table. Place different newspaper – maybe even something totally different like a tablecloth. Return specimen in different position (flipped over). Now, you can use multi-chunk alignment with points-based chunk alignment, as nothing but the specimen is there to make the chunks match each other. Granted, it may not work, but you can always resort to manually placed markers. OK, now is the time to say that bit about using the internal flash. Obviously, in an ideal world, you have brought a ring light (usually LED) or ring flash, but let’s assume that you haven’t. If you point your camera at the specimen you’ll usually hold it upside up, so that the flash is above the lens. And in normal conditions, whether outside or indoors, the majority of the light will come form above. This means that you naturally get a darker, less-lit underside of the specimen, and that you add to this effect by having the flash light slightly from above, too. So, fix this: flip your camera upside-down! It sounds stupid, and it can be cumbersome, but having the flash under the lens gives you an extra 10% or so of surface you capture well-lit, right where it matters: on the outward edge of the specimen, where you want to find many good points to match one chunk to another. What else? For one thing, do try out unusual camera programmes! Many DSRLs and even cheap point&shooters offer HDR modes. These modes take several images at different ISOs (usually) or exposures (better but rarer), and combine them into one image that is more evenly lit than any normal photo. 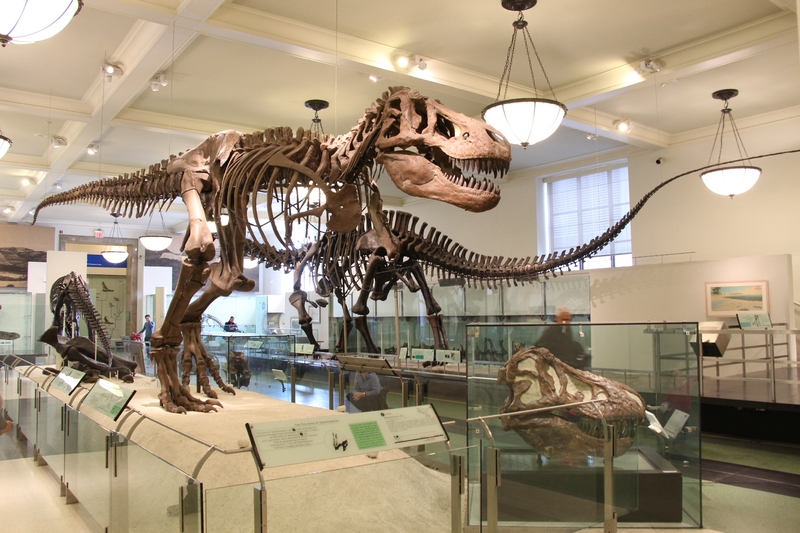 As this post direly needs a photo now, here’s one – a HDR mode photo I took with my Canon EOS 650D of the AMNH’s Tyrannosaurus mount. Oh well, it’s a cool mount, so two photographs instead of one 😉 Notice how there are no black shadows and no white-outs? That’s the power of automated HDR. Sadly, the 650D does this via ISO variation, and that includes high ISO values, leading to a lot of noise in the image. But still: these images align and produce dense point clouds much better in Photoscan than normal, hand-held ones would. So, no tripod? Try the HDR mode! If you run Magic Lantern on your camera, you can do better, varying the exposure, not the ISO, too. 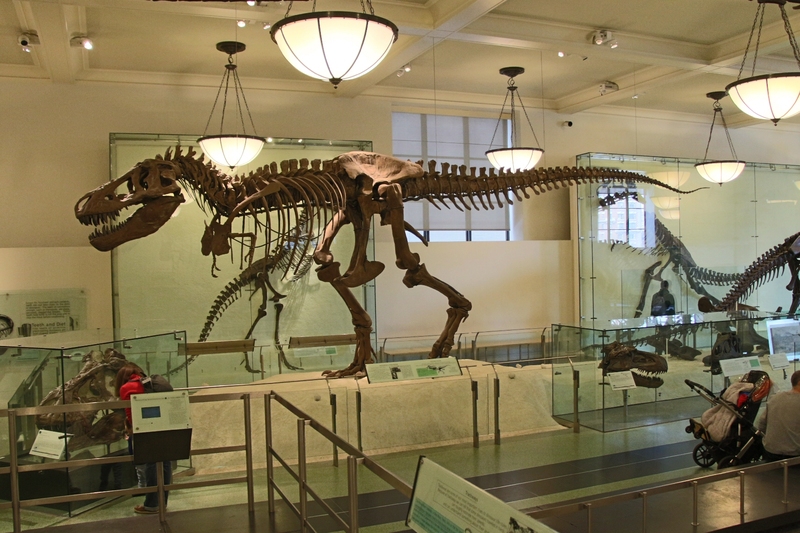 This entry was posted in AMNH, Digitizing, Dinopics, Dinosauria, How to, photogrammetry, Theropoda, Tyrannosauridae, Tyrannosaurus. Bookmark the permalink. 6 Responses to Photogrammetry tutorial 9: Quick and dirty! I was, for four days, recently. An unexpected journey with an even less expected detour. I’ll yell before I come over next time 🙂 I would love to get shown around by your personally! By the way, did you use this technique for the models you made that Mr. Switek for his research on Kentrosaurus’s tail flexibility?